Turkey's Davutoglu Still Wants a "New Middle East"
Originally published under the title, "Bad News: Davutoglu Wants 'New Middle East'." 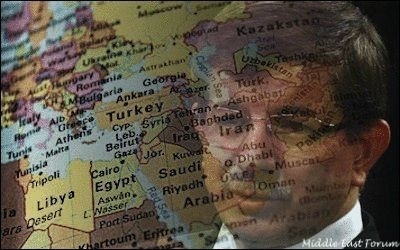 Turkish Prime Minister Ahmet Davutoglu still dreams of a new, Turkish-led Middle East. When, in a recent speech, Turkish Prime Minister Ahmet Davutoglu pledged to defend all faiths, "even Buddhism," a Buddhist friend sent a message saying, "I understand we were wrong to feel safe from the wrath of Turkish Islamists' Sunni supremacy. Judging from how they wanted to crush every other faith, including different disciples of Islam, while faking to respect them I now worry about the Buddhist faith." Echoing the Buddhist friend's fear and commenting on Davutoglu's most recent remarks on the making of a new Middle East, an EU ambassador told this author in a telephone conversation: "I think we should be worried again." Fresh in the job but apparently full of hope, then foreign minister Davutoglu said in an October 2009 speech in Sarajevo: "As in the 16th Century, when the Ottoman Balkans were rising, we will once again make the Balkans, the Caucasus and the Middle East, together with Turkey, the centre of world politics in the future. That is the goal of Turkish foreign policy and we will achieve it." Just a few years ago, Ankara was confidently spearheading efforts to build a European Union of the Middle East. At that time, Turkey's best regional ally was Syrian President Bashar al-Assad, now its worst regional nemesis. Relations with Jerusalem were deteriorating but not yet frozen. Turkey was the rising star in almost every Arab capital. Ankara was confidently spearheading efforts to build what looked like the European Union of the Middle East -- a free-travel, free-trade zone between Turkey, Syria and Jordan, which would then expand to Lebanon, Iraq and Iran. Thus, the academic-turned-foreign minister would rebuild the Middle East under Turkish leadership. On the historic march of our holy nation, the AK Party signals the birth of a global power and the mission for a new world order. This is the centenary of our exit from the Middle East ... whatever we lost between 1911 and 1923, whatever lands we withdrew from, from 2011 to 2023 we shall once again meet our brothers in those lands. This is a bounden historic mission. Nearly five years after Davutoglu set out on a self-declared mission to remake the Middle East, Turkey is the only country in the world that has no ambassadors in all of Jerusalem, Damascus and Cairo. The ambassador it appointed for Libya has never taken up the job, due to understandable security concerns. Its neighbour to the south is no longer Syria but the Islamic State [IS], a coalition of jihadists it once supported (and perhaps indirectly supports even today), which has become a major security threat to Turkey itself. Its citizens are a high-currency in Lebanon's kidnapping market. Since 2013, its missions in Somalia, where it has heavily invested in the past few years, have been attacked. Today, Turkey is the only country in the world that has no ambassadors in all of Jerusalem, Damascus and Cairo. The multiple policy failures find an echo among the Turks. According a survey released on January 20 by Kadir Has University in Istanbul, "Social-Political Trends in Turkey, 2014," Davutoglu's foreign policy has an approval rate of 33.8%. On a more specific level, the same survey found that only 21.6% of Turks approve of Davutoglu's Syria policy, and 21.5% approve of his Egypt policy. Yet Davutoglu remains miraculously optimistic. In the speech that "worried" the EU ambassador, the Turkish prime minister said that Turkey was seeking a new Middle East that will be a home for Turks, Kurds and Arabs together. Speaking in the predominantly Kurdish province of Diyarbakir in Turkey's southeast, Davutoglu said: "We aim at a new Middle East." He further said: "Against the tyrants in Syria [Assad] we want a new Middle East that Turks, Kurds and Arabs build in everywhere. Turkish, Kurdish and Zaza braves will be together everywhere again. Hopefully, this brotherhood will become eternal." And, typically, he added that Turkey would continue representing Islam, "with the crescent on its flag." Davutoglu is mistaken to think that Islam can be the bond to keep Middle Eastern nations in peace. Once again, Davutoglu is mistaken to think that Islam can be the bond to keep Middle Eastern nations in peace. In Diyarbakir, he was happy to greet around 100,000 Kurds who protested Charlie Hebdo and cheered for the Kurdish Hizbullah, a radical Sunni Kurdish organization. As a courtesy to Davutoglu "The Lovers of the Prophet Platform" had organized a two-hour long protest at a central square in Diyarbakir. They brandished placards and shouted slogans targeting the French magazine, including "I am Hizbullah in Kurdistan," "I am Hamas in Palestine," "I am Malcolm X in America" and "I am Imam Shamil in Chechnya." In a speech, Molla Osman Teyfur, chairman of the pro-Hizbullah Free Cause Party, said: "As long as you are the enemies of Allah, we will be your enemies." He vowed to "cut the tongue that talked against the prophet." Davutoglu has been trying and repeatedly failing to remake the Middle East on the common bond that is Islam. He does not learn from his past mistakes. He does not acknowledge failure. His repeated promise of a new Middle East is not a good omen for the region.